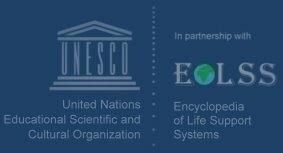 Encyclopedia of Life Support Systems - with contributions from several thousand scholars, from over 100 countries and edited by over 395 subject experts and over 8000 authors. The Encyclopedia is integrative and transdisciplinary in nature and will be of interest to the education community. EOLSS represents the theme of humanity, embedded in nature and constrained to find ways of maintaining a relationship with nature based upon understanding and respect. EOLSS presently about 534 volumes (https://www.eolss.net/ebooklib/) are ready and gradually this number will increase to ultimately capture the entire EOLSS-online body of knowledge in about 600 volumes. I will be referring my students / colleagues to this Digital Library regularly to assist with their studies and research. EOLSS will enhance the Library's reference base with the knowledge for our times and will be valuable addition to the organization's scientific resources. EOLSS online is made available free of charge through UNESCO to Universities in the UN list of least developed countries and to disadvantaged individuals worldwide. Subscription using the Preference code 'PA17452', qualifies the library to get free trial (institutional) access for five months. This offer is absolutely free of charge and there are NO hidden costs.